St. Juan Diego on December 9, 1531, at Tepeyac Hill, site of the ancient Aztec goddess Tonanzin. She instructed him to tell the bishop to build a church in her honor at the bottom of the hill. “Here I will make known and show my love, my compassion, my help, and my protection to the people,” she said. The bishop was skeptical until December 12, when St. Juan Diego opened his cloak before the bishop, spilling fresh roses on the ground and revealing a picture of Our Lady of Guadalupe. Today, millions visit her shrine at Tepeyac Hill, now part of Mexico City. We turn to you, Our Lady of Guadalupe, and ask that you bring hope to our troubled world. As you did in 1531, make God’s love and compassion known to us today. Open the eyes of the leaders and the comfortable so that they will recognize their responsibility to care for the less fortunate and the poor. Open the hearts of the downtrodden, fill them with the warmth of God’s love and give them hope in tomorrow. Help us all to follow your Son’s call to love one another as He has loved us. Amen. Although Our Lady of Guadalupe is associated with Mexico, her appearance there in 1531 was really to bring God’s love to all the people of the New World, not just to those living in the land that would one day become Mexico. The Church recognizes her as the patroness of the Americas. Today, the countries that make up North and South America stand as separate entities and few of us identify with the continent in which we live. Yet Our Lady of Guadalupe continues to remind us that we share a common heritage as “New World” people and, through God, are truly brothers and sisters. God calls us to love and care for one another. Our Lady of Guadalupe, we seek your guidance in helping us now, in the 21st century, to reach out with God’s love to our neighbors throughout North and South America. May we who have been blessed with so much material wealth be inspired to share with those who have nothing. May we also give of our time and talent to work for peace and justice in North and South American countries torn by strife and plagued with poverty. May we answer God’s call to love and care for one another with fervor and persistence. Amen. Mary’s appearance at Guadalupe came just ten years after Cortez defeated the Aztec people and destroyed their civilization and their religion. The Native people were enslaved and suffered great hardship, cruelty, and humiliation. Millions were dying from hard work and from plagues and diseases that came with the Spaniards. Our Lady of Guadalupe arrived to put an end to the chaos and to call both the Native people and the Church of that time to a conversion. Her role was to bring people from two different “religions” and cultures together to form a new branch of the Church that would be unique to the New World. Today we are that unique Church. We are a blend of many cultures and this is reflected in our worship and in the ways we reach out with love and compassion to one another and to people all over the world. Our Lady of Guadalupe, we thank you for coming to the New World and lighting the way to a new Church that embraces diversity. We continue to need your help and guidance today in bringing the diverse cultures of our world together. Help us to respect our differences, recognize all that we share in common, and join together in glorifying God through our loving relationships with one another. Amen. St. Juan Diego, to whom Our Lady of Guadalupe appeared, was an ordinary man who was chosen by God to do an extraordinary task. He described himself in this way: “I am a small man, a rope, a tiny wooden ladder, a tail end, a leaf. I am a nobody.” Still God called him to open the door of the New World to Christianity. And God did not let him flounder alone. 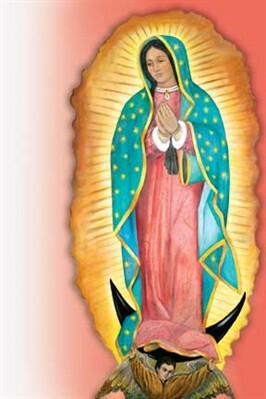 God worked through Our Lady of Guadalupe to enable St. Juan Diego to carry out the task he was called to do. Each of us is an ordinary person called by God to bring His love and compassion to the world. We may not be asked to do anything extraordinary, yet God is always with us as we go about our work. God, You are everything to me. I am, like St. Juan Diego, just an ordinary person. Yet I offer my whole self to You and stand ready to do Your will. Open my ears to hear Your call. Open my heart to respond as St. Juan Diego did. If I grow weary, become impatient, or tremble with fear, come to my rescue and give me the strength I need to continue. Amen. Most of the Native Americans did not embrace the new religion presented by the early missionaries. For one thing, the missionaries were Spaniards, just like the soldiers who enslaved and mistreated the Native people. For another, the missionaries preached the “fire and brimstone” version of Christianity that was popular at the time. St. Juan Diego, however, was among the few who did embrace Christianity. It took courage to go against the majority of his people but he followed the yearning in his heart for God. There are times when we, too, must go against the crowd and take an unpopular stand. At these times we also must follow our yearning for God. God, You know how difficult it can be for me to stand up for what I know is right and just when I am surrounded by those who think differently. It is so easy and comfortable to go along with the crowd. Give me the courage, God, to be true to my convictions. Do not let me be stopped by my fears of what others might think. Guide me to know Your will for me and then enable me to carry it out in my words and actions. Amen. St. Juan Diego was in his fifties when Our Lady of Guadalupe appeared to him. In his day, most people died at a much younger age. He was considered elderly by those who knew him and, in the tradition of his Native people, he was respected not only for his age but also for the wisdom that comes with age. With its emphasis on youth, our society today tends to ignore the elderly. We grow impatient with our elderly, sometimes seek to avoid them and fail to take advantage of the wisdom they have to offer. We pray today, God, for our elderly. They have given You a lifetime of service and they continue to bring Your love and compassion to others. You have filled them with wisdom, obtained through experience. Enable us to listen and learn from them. Help us to seek and enjoy their company, to work beside them and to treat them with respect. Amen. Our Lady of Guadalupe could have appeared to a leader of the Aztec people or to someone who held a position of wealth or prestige in the Aztec society. Instead, she chose St. Juan Diego, an honest, hardworking farmer. He did not question her and followed her commands. Still, his concern for his dying uncle caused him to miss a scheduled meeting with her. But Our Lady understood and, through her, God healed St. Juan Diego’s uncle. There are times when our concerns for others in our life keep us from spending as much time as we would like in prayer. Taking care of children, the sick, or an elderly family member can be exhausting and time consuming. Yet God understands, waits for us and, as Our Lady of Guadalupe did, seeks us out. I sincerely want to spend time alone with You, God, in prayer and reflection. But there are times when family responsibilities consume my time and energy. There are also times when I am preoccupied with worry about a family member, a friend, or myself. At these times, Lord, forgive me my preoccupation and seek me out, wherever I am. Find me and give me the gift of time with You. It is at these times that I most need You and desire You. Amen. No one knows what Mary looked like when she lived on earth, but we can be fairly certain that she did not look like the dark-skinned Aztec people. Yet, as Our Lady of Guadalupe, she assumed their image and embedded it in St. Juan Diego’s cloak or tilma, where it can still be seen today. Like all Native Americans, the Aztec people were conquered and enslaved by the Europeans. Their land was taken from them and they were made to feel inferior. By becoming one of them and appearing to one of them, Our Lady of Guadalupe delivered the message to the people then and to us now that all people have dignity in the eyes of God and are to be respected as God’s children. No nation, ethnic group, or class of people is better than another. Are we people of the third millennium much different from those of St. Juan Diego’s day? God, we have heard Your message of equality delivered to us by Our Lady of Guadalupe. We ask You to amplify this message now so that it may be heard loudly and clearly over the din of fighting, disrespect, and indignity that exists in our world today. Terrorists roam the world, striking fear in those they hate. Ethnic groups battle one another and pursue ethnic cleansing. Nations stand on the brink of war. People in many parts of the world are enslaved, severely mistreated, robbed of their dignity, and denied even the basic needs of food, clothing, and shelter. Even in our own comfortable lives, we turn away from those who are from a different culture or ethnic group. Come to us, God. Show us the way. Enable us to see with Your eyes, to hear with Your ears, to love with Your heart. Amen. Those who study ancient cultures say that in the Aztec culture of St. Juan Diego’s time, the tilma (cloak) was the exterior expression of the person’s innermost identity. By making herself visible on his tilma, Our Lady of Guadalupe imprinted herself and her message of God’s love in the deepest recesses of St. Juan Diego’s heart. She reminds us today that God lives deeply in our hearts and continually works through us to make His love visible to others. God, I believe that You live within me. You know me better than I know myself. You know my strengths and weaknesses, my hopes and fears, my desires to serve You, and my failures to do so. I give myself to You completely. Shape me into the person You want me to be. Strengthen my faith in You. Increase my hope in You. Wrap me in Your love and send me into the world to share all You have given me with all I meet. Amen.